Rallies in regulation and overtime helped the No. 4 ranked Druid Hills Red Devils pull out a 3-1 penalty kick thriller over the Perry Panthers in a Class 4A boys’ Sweet 16 defensive battle at Adams Stadium on Wednesday night. Druid Hills trailed for most of the game as Perry got a goal from Mason King in the first half to take a 1-0 lead which held until just 9:39 remained in the game. Perry goalie Joseph Lee had a shutout going when he was stepped on and injured with 9:58 to play and had to leave the game. A penalty on the play the injury occurred set Druid Hills up with a free kick from about 15 yards away on the right side. Izaak Clarke took the kick putting it just under the bar where it bounced off the replacement goalie’s hands and into the goal to tie the game at 1-1 with 9:38 to play. The two teams went into overtime and Perry scored on a long moon shot that bounced off Druid Hill’s goalie Ruben Angeles and was knocked into the goal by Lazar Hunter with 22 seconds left in the first overtime period. The Panthers (12-5-1) seemed to have the game in hand during the second overtime period when the Red Devils got a corner kick from the right side as the clock ticked under 40 seconds. Clarke again played the role in the game tying goal as he lifted the kick in front of the goal and it was knocked to the side by the goalie, but Druid Hills’ Nate Jackson knocked the deflection in to tie the game with 22 seconds to play to make it a 2-2 game. The Red Devils (11-9-1) held serve as the final seconds ran off to send the game into penalty kicks. Freshman goalie Ruben Angeles was tough in the penalty kick session blocking two Perry shots and forcing another high off the cross bar. Meanwhile Angeles’ teammates made it 2-0 quickly as Jeremy Lloyd and Nate Jackson scored on the first two attempts by Druid Hills. 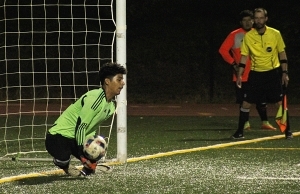 A Luke Merritt made penalty kick and two misses by Druid Hills made it 2-1 as sophomore Alan Alvarado made his way to kick against Perry. His kick was true to seal the 3-1 penalty kick victory for the Red Devils. Druid Hills moves on to host No. 7 ranked Northwest Whitfield (15-4-1), the Region 6 No. 2 seed, which defeated No. 10 ranked North Oconee 4-3 in penalty kicks after being tied 3-3 at the end of regulation and overtime. The game will be played Saturday with a time and site to be determined. The No. 3 ranked Clarkston Angoras (17-4-1) dropped a tough 1-0 decision to No. 4 ranked Carrollton on the road on Wednesday. A penalty kick with five minutes to play in the game proved the difference as Carrollton (17-3-0) advances to the Elite 8. The Tucker Tigers (11-7-2) move into the Elite 8 for just the third time in program history after defeating Valdosta (15-3-1) in a 4-2 road win on Wednesday. Tucker advanced to the Elite 8 in 2012 and 2015 and is looking to make the Final Four for the first time in program history as the Tigers travel to Chattahoochee on Saturday at a time yet to be determined. Chattahoochee defeated Creekview 2-1 to advance.